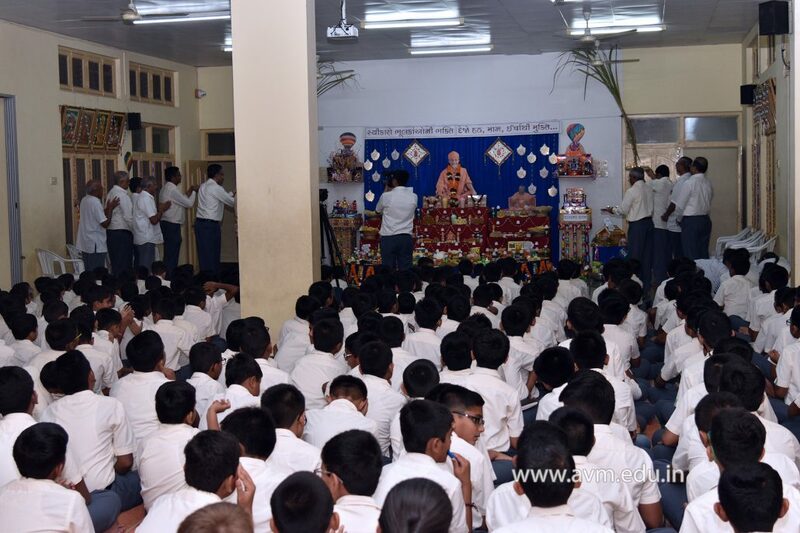 Atmiya Vidya Mandir is a distinctive Temple of Learning as it is blessed and led by the divine vision of His Divine Holiness Param Pujya Hariprasad Swamiji. One of His simple yet profound ideals is “જીંદગી આનંદ માટે છે, મરવા માટે નથી”. Consequently, one can find here an amalgamation of education, festivity and culture. Every Friday is celebrated as a ‘Festive Friday’. This is the time, pupils experience joy of celebrating different festivals in their true spirit. The sole objective of celebrating Indian festivals is to promote and preserve Indian culture in the hearts of young angels of future India. Once again Atmiya Family gathered and made the evening of 30th November colourful, festive & devotional by celebrating Bhoolku Annkut; a festival of devotion. About 125 eatables including fruits, chocolates, biscuits, snacks, refreshments, beverages, sweets & meals with beautiful garnishing were offered to Thakorji in decorative baskets, bowls and plates. Annkut was arranged on small steps as well as semi-circular platform adorned with flowers and rangoli patterns. Celebration commenced with a small prayer and an introduction describing the glory of the day by two young hosts, followed by an inspiring speech delivered by the principal Dr. Vijay Patel. He shared the incident of how Lord Krishna was pleased with the handful rice offered by His beloved childhood companion poor Sudama and blessed him with a beautiful palace in return. He added, in a like manner, God always counts our devotion and blesses us with inner peace and spiritual wealth. The occasion ended with ‘thaal’ and ‘aarati’. All the elders performed aarati, artistically made with flowers and lamps. Finally, all departed with prayers expressing their gratitude, had Annkut darshan & prasad capturing the memory of the auspicious moment in their hearts forever.